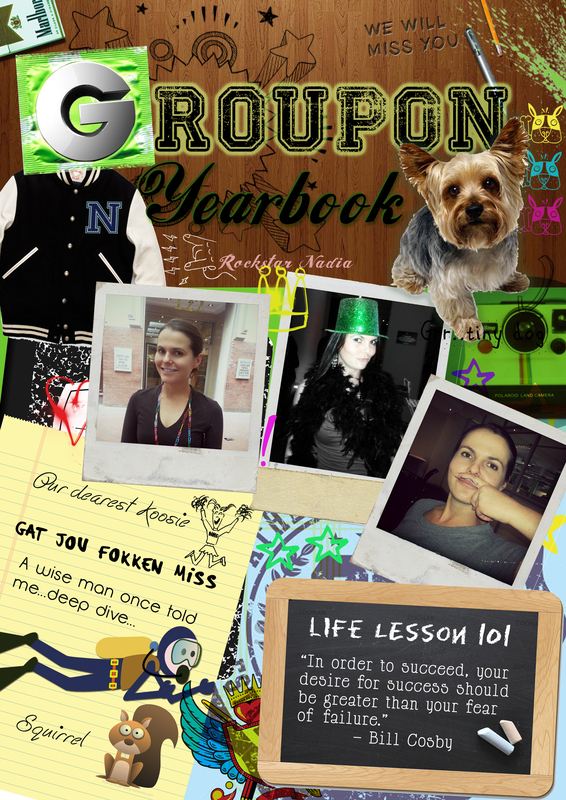 Sooo in yet another design adventure I have designed a yearbook cover for my sister’s colleague who is leaving the company. I added a little bit of this and that to make a theme that I thought worked! Well the desk obviously points to the learning environment of high school kids. The notepad papers and doodles are the stationary and elements of boredom from high school kids – doodling in class instead of listening to the teacher! The dog is a inside joke and so is the diver. The jacket is the typical jock jacket with the letter ‘N’ for Nadia who is the chick whose leaving the company. The photographs are of her and I chose Polaroid because its old school and its popular now. The condom under the ‘G’ represents the good times to come when high school kids hit college…I’m not promoting promiscuity though so chill. I used a ‘college style’ font. Threw in a chalk board and cool quote for good measure and BAM! A cover was invented. I'm pouring my passion for design and branding into this.